The results will be posted asap, and we expect to have them on the website by the middle of the week. In the meantime, those who came should book Saturday 12th October at Lancaster University in their diaries, for the next event especially for schools. Thanks to Martyn Roome for these photos of the Farleton event. Minutes of the 49th AGM, held last Thursday, may be viewed here. At first sight a Cat C event limited to 200 competitors with the inconvenience of no EOD might not have looked so attractive. However, on an excellent area like Farleton Knott not likely to be used for another 5 years and with entries at £7 for seniors I hope that the courses made it well worth the travel. Results for today's level C event are now on-line here. RouteGadget is ready to receive your routes here. Helen Ockenden (W16) represented England in the Junior Home International last weekend, and Sue (W50) and Quentin (M50) Harding are both selected for the Veteran Home International in two weeks' time. 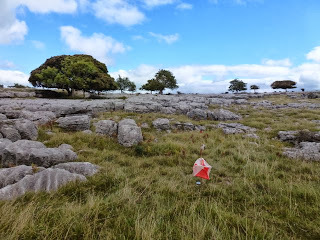 More details on the English Orienteering website. Matt Driver of SELOC is putting on a street O warm up / training event on the Ramsbottom map as part of SELOCs club night programme. Details as follows: Monday 30th September, Toby Carvery Greenmount (formally Bull's Head), Brandlesholme Road, Greenmount, Bury, BL8 4DS. Starts 6.30 - 7 pm. 45min / 60min score. Linear course approx 3km straight line / 5km actual. Please let Caroline Barcham know via email to c.barcham@sky.com if you're thinking of coming to assist map printing. The entry limit of 200 for Farleton on Sunday 22nd September was reached today. Please note that there are no more entries available either in advance or on the day. The Bolland family are organising an 8km TRA certified trail race around Nicky Nook on 29 September. Lovely route (with a sting in the tail). Walk option, fun run, junior and kiddie races. Great family day out based at Wyresdale Park Hall (Applestore Café). Terry Bolland senior has advanced Alzheimers and this event is dedicated to dementia awareness, with all proceeds going to Alzheimers Society. Margaret, Claire, Brendan, Sean, Helen, and Terry plus their families would love as many orienteers as possible to be there. If you know Terry or any of the Bollands, or you are affected yourself by dementia in some way, or you just fancy doing the best trail race ever, please get your entries in and help make this a great event. And tell your friends……..More details, www.facebook.com/TheRace2Remember or call Claire on 01524 382976 or Sean on 07956 450276. Or check out this flier. There are still places available on all courses for the forthcoming level C event, for which final details are now available. Pre-entry only via Fabian4. The annual general meeting is to be held on Thursday 19th September at 7.30 pm at the Victoria Institute, Caton near Lancaster. All welcome; please bring a contribution to the Jacob's Join to follow.